The womens SUP by Umami SUP is the ideal paddle board for women at any skill level. Its 9ft 2inch height is the prefect inflatable for a woman and is light weight at 19.25 lbs and very portable whether inflatable or deflated. The board itself is virtually indestructible because of the strong PVC material its made of. Theres no need to worry about dings, cracks, or scrapes like other hard or foam SUPs. 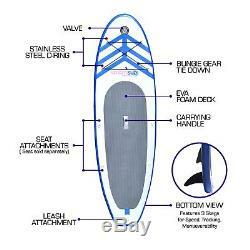 The womens 9ft 2inch standup paddle board can be run up on the beach, dropped, or rammed into a dock or boat. The size of this Newport Vessels SUP is ideal for women, giving women riders a sturdy base with max buoyancy, while still offering a small size for maximum maneuverability and portability. Women's 9ft 2in Umami SUP Paddleboard (comes with). 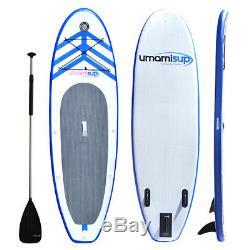 9ft 2in Ultra Rigid Umami SUP inflatable paddle board. SUP Backpack Mesh Carrying Bag. One of the key factors which makes the womens 9ft 2in SUP great is the high quality drop stitch fabric core and triple layered Korean PVC it is constructed of. The board is able to become very rigid and firm while still being lightweight. This material is also very flexible and foldable. Meaning is can be knocked around and not be damaged as well as being able to deflate and roll up. There are also additional D-rings at the top of the SUP for any additional gear such as bags, clothing, or life jackets. While inflated the light board can be carried using it carrying handle and when deflated it can be stored and carrying in its backpack mesh carrying bag. 9ft 2inch Women's SUP Technical Specifications. View the full list of technical specifications for the Women's model 9ft 2inch inflatable standup paddle board. The most important and most differentiating features of the Newport Vessels Women's SUP is the PVC material used, the ultra high-end German adhesives, and rigorous manufacturing process that only Newport Vessels brand inflatables is cable of. High Pressure PVC Drop Stitch. One of the biggest advantages for Newport Vessels inflatable SUPs is the able to store and transport it easily. 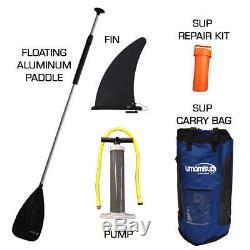 It only takes 5 minutes to inflate or deflate the standup paddle board using the hand pump it comes with. This gives anyone the benefit to simply carrying to their favorite beach, lake or bay without the hassle needing a car rack to transport and carrying a heavy hard or foam SUP. When not in use the womens SUP takes up little space and can easily fit in your garage or closet. Plus it weighs less than 20 lbs. The high pressure drop stitch fabric the SUP is made from allows the board to become rigid when fully inflated. You would barely notice the difference between the inflatable SUP and other EPS or Epoxy hard board styled standup paddle boards. However, the Newport Vessels womens SUP is the fraction of the cost as these other hard framed SUPs. To go along with the drop stitch fabric our SUPs are comprised of a triple layer PVC imported from Korea with German adhesives. These are some of the highest quality materials on the market for inflatable SUPs. This allows our SUPs to last longer against the elements and are stronger to prevent damage. Newport Vessels boasts a meticulous manufacturing process that includes quality control pressure tests, water leak tests, UV tests, and stretch tests throughout the manufacturing process. Designing and manufacturing boats since 2008, has provided the Newport Vessels design team with incredible inflatable boat design and manufacturing technical experiences that are constantly evolving to create better and better inflatable sport boat products. The item "Newport Vessels Inflatable Stand Up Paddle Board SUP 9ft 2in" is in sale since Friday, April 7, 2017. 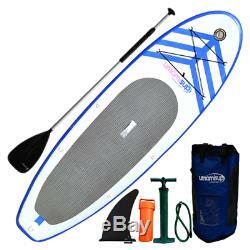 This item is in the category "Sporting Goods\Water Sports\Stand Up Paddleboarding\Stand Up Paddleboards". The seller is "toreroinflatables" and is located in Stockton, California. This item can be shipped to United States.